I promised a review of The Bivouac, and finally, here it is! 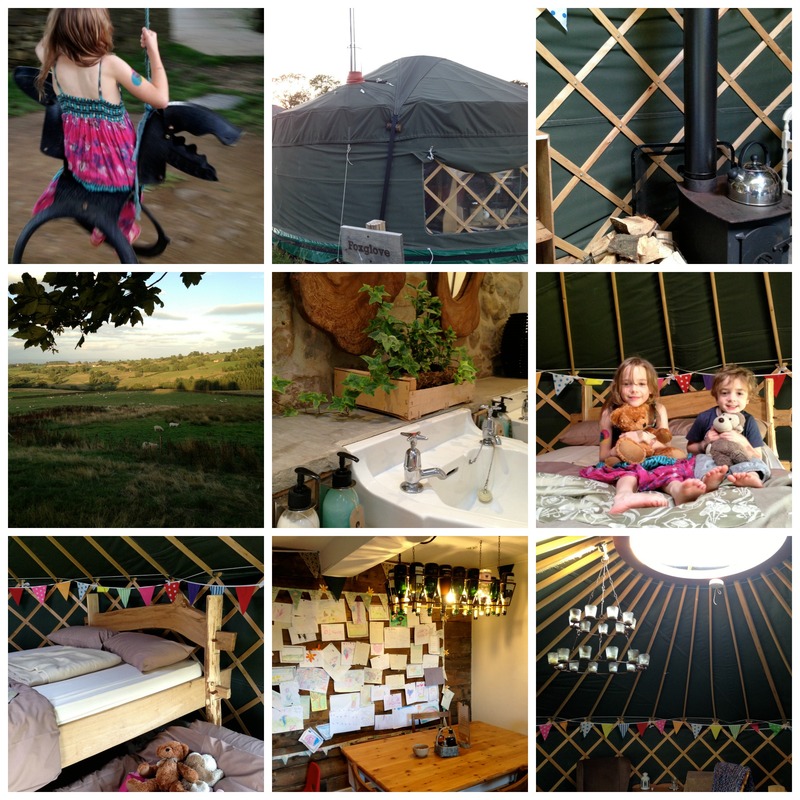 The Bivouac is a selection of yurts, log cabins and a bunk barn, just outside Masham in the beautiful Yorkshire Dales, with a cafe and small shop. Just along from the site is a folly known as Druid’s Temple and it’s also along a long-distance walk route, so attracts plenty of day visitors as well as overnight guests. We stayed for four nights in ‘Foxglove’, one of the yurts. All the yurts are situated together in a field close to the cafe, toilets and lovely shower block, which is handy when you’ve got small children. Despite it being the height of the summer holidays, some of the yurts were empty and so it was relatively peaceful – even though they’re not exactly soundproof! We had decent weather most of the time which was a bonus too, as it meant we were able to sit outside once the kids were finally in bed, and enjoy the stars, and on one night, watch the lightening flash across the sky in the distance, which was fascinating to watch – until the rain arrived in the middle of the night and woke us up! Inside the yurt was lovely and welcoming, from the chalkboard with our name on, to the cosily made up beds, rustic-chic furniture and giant beanbag. I loved all the tea light lanterns dotted around the place ( it was off-grid, so we needed them!) and wood burning stove, complete with enough logs to last our stay. It has to be said that one yurt with four people in can get a bit overwhelming. Anyone with small children knows what it’s like to try and get them to bed, and when there are no doors to shut and bedrooms to creep away from whilst crossing your fingers that they’ll go to sleep, it can be tough. But they did love sharing a room! Walking to Druid’s Temple was an easy, short walk, and the thunderstorm we’d had overnight provided sufficient mud for my obsessed son, with the ‘hedgehog hunt’ map keeping my six year old daughter entertained. Druid’s Temple itself is a fascinating, eccentric folly, and we enjoyed looking around it and playing at monsters! We also paid extra for them both to attend a drumming workshop one day, which they both enjoyed. If there was one problem, it was the sole tyre swing. Which my kids both loved. And you know what one swing between two kids leads to? Yes, endless arguing over taking turns. A few more pieces of wooden, sympathetically integrated play equipment would have been great, although I did appreciate the low-key feel of the place and they did find friends to play with, which helped enormously. I was very happy to see them go off and play in the field and use their imaginations instead of relying on being entertained. That feeling I had of being comfortable with letting them wander a bit was lovely and refreshing too – no ‘cotton wool’ parenting for me! Once they’d found friends, the kids did settle down from the first day’s over-excitement, which meant, joy of joys, that I was able to go for a shower on my own! The shower blocks in Bivouac are far removed from many camping shower blocks, with warm flooring, interesting slate tiles, hairdryers and wooden doors and luxurious smelling handwash and lotion. There was evidence of lots of environmentally friendly practices being used as well, which was impressive. I’m planning to adopt some of their ideas at home. We mainly cooked for ourselves, using the gas stove provided in the yurt, but we did eat in the cafe one evening and the food, from superfood salad to burger and chips, was all really great; obviously fresh, interesting to eat, but not too expensive. They have a weekly ‘community supper’ which sounds like a lovely idea. I was happy to see that they had ‘plain pasta with parmesan’ on the kids’ menu too, proof that it’s not just my girl who loves that! Someone who works there clearly understands what many young children will and won’t eat.